Awesome desk -- designed by Bugatti of car fame -- sent to me by Art Donovan. Strikingly original, Carlo Bugatti's furniture combines the picturesque asymmetry of Art Nouveau with the exoticism of Moorish and Japanese influences. 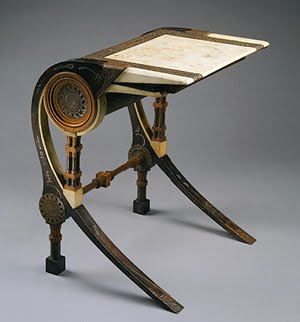 The writing surface of this desk is covered in vellum, held in place with punched copper strapping; the walnut legs are inlaid with pewter imitating calligraphic brush painting. The unusual profile of the desk suggests the jaws and teeth of an alligator. It's a wonderful piece, isn't it? The auctionwebsitescript is leading provider of Reserve Auction Script & software and other auction applications.Create your own proffessional reserve auction web site fully customizable, easy to install, highly configurable.